ISLAMABAD, Sep 6 (APP):Minister for Information and Broadcasting Chaudhry Fawad Hussain said on Thursday the government will provide all necessary resources to the armed forces for ensuring defence of the motherland. 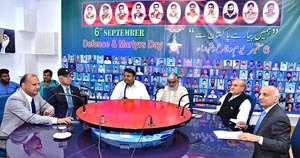 He was speaking in special transmission of Radio Pakistan’s News and Current Affairs Channel to mark Defence and Martyrs Day of Pakistan at National Broadcasting House here. The Minister said the matters related to defence of the country were discussed at length during Prime Minister Imran Khan’s recent visit to the General Headquarters. He said the armed forces are pride of the nation, and the nation salutes them for their sacrifices. He said peace in the country owes to the sacrifices of the armed forces. To a question, Chaudhry Fawad Hussain said Pakistan wants peace in the region and desires for improving relations with India for achieving prosperity in the region. He, however, regretted that BJP-government in India was pursuing the agenda of Hindutva instead of taking measures to improve relations with Pakistan. Paying homage to all the martyrs who laid their lives in the line of duty, Chaudhry Fawad Hussain said Defence and Martyrs Day is the day to commemorate the sacrifices of the martyrs and commiserate with the bereaved families.